Here’s the third part of our series Being Women – the Balancing Act, where we have candid discussions focussing on the women of today, who beautifully juggle work and family. We spoke with some of the most prominent women from the Indian Analytics Industry this INTERNATIONAL WOMEN’S DAY. 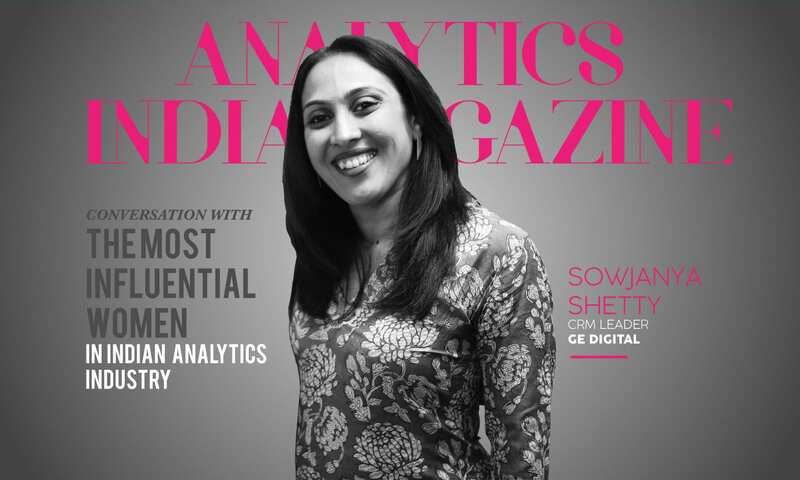 We spoke with Sowjanya Shetty who is currently serving as CRM Leader at GE Digital in Bangalore. Sowjanya Shetty: My growing-up years, I always had wonderful math teachers and I totally enjoyed the subject. So much that I wanted to be a math teacher when I grew up! Math is one subject which requires both a good problem comprehension and an excellent solving ability and cannot be crammed. Many profound mathematical ideas don’t require advanced skills to appreciate. Even now in our day-to-day functioning, we are not using formulas or variables like x and y, but we always face situations where we need to make decisions, analyze and weigh things regarding its relevance. All these things are related to Mathematics, isn’t it? SS: It’s always been my Mom. My dad passed away when I was just three years old, and my mother took charge and she made a way for my sister and me. We all take from our parents a set of expectations of what is it we are supposed to do. From my mom, I learned to appreciate and value independent women, balancing work and family, financial planning, resilience, egalitarian views, open communication and a lot more. Her efficiency made our lives comfortable. SS: I believe that being a leader is a choice and not a rank. There are three innate characteristics about me. Firstly, I am a big follower of servant leadership, it’s all about influencing, trusting, listening, communicating and understanding people. Secondly, I strive to build relationships and continuously learn from others. Thirdly, over the years I’ve internalized a design thinking mindset that finds ways to balance between analytical, creative and practical thinking. These three facets about me collectively allow me to think out of the box when faced with a problem and I think in a lot of ways defines my leadership style. SS: I’ve worked in teams where I was the only girl, to teams where there were more women than men. There are some petty slights and feelings of alienation that women experience every now and then. However, there is a silver lining: Having worked in the tech space for more than 20 years, I think for women who come out on the other side, there can be great satisfaction. In fact, now that I’ve matured in my field, I think that in some ways women in tech may have it better than men. After all, we do stand out. And if we’re confident enough to be ourselves, we bring a different perspective to our companies – one they really need, and which more and more of them know they need. SS: I see a big discrepancy in this regard and I think we have a long way to go. Not only in the tech industry but across sectors. I believe that the first step towards this is for companies to be transparent about gender pay issues. Recently I read that Adobe in India announced pay parity aimed at abolishing the gender pay disparity. I like that approach. Most tech companies have a long way to go. AIM: What issues do women face after they come back from maternity leave? SS: Becoming a mother is a life changer for all women. There are many books, blogs, and advice from experienced folks around being great parents. However, no one prepares you for what it means and takes to be a mother; what happens to you mentally and physically. I had to go back to work three months after my daughter was born. I had a wonderful manager and a very young but accommodating team. The picture isn’t that rosy for all though. The key is to plan appropriately and make all necessary arrangements both in your professional as well as personal life to enable a smooth comeback. When you return to work soon after childbirth (or even months later), you will be navigating physical and hormonal changes, self-doubt coupled with the usual stresses of deadlines and meeting project milestones. That said, this adjustment period is a finite one. Delegate to give others a chance to help you cope. SS: According to the society, a woman’s preference should be family. My life revolves around my family. But I derive joy and passion from work, and I won’t choose one over the other. SS: I’m a living example of the saying, “Hire a lazy person in your team and they’ll figure out the most effective and efficient way of doing things.” In India, it is much easier to maintain a work-life balance because of the support system you can build around yourself — you can hire someone to cook, clean, drive, etc. I can, therefore, spend time on things that are important like family and me-time. It’s all about delegating. SS: I attended a workshop on unconscious bias and it was an eye-opener for me. We (a group of industry leaders, HR professions, and young engineers – both men and women) were made to stand in a single line and were blindfolded. We were then asked questions like, “Were your parents educated”, “Did your parents have jobs when you were growing up”, “Did you have the luxury to walk out of the house at night without being scared,” etc. We had to take a step forward every time the answer was “yes”. I’ve always had egalitarian views, but this exercise made me realize that diversity is not just limited to gender, but extends to age, physical abilities, sexual orientation, age and many more attributes. I’ve since then worked on my own biases and strived to create and work in inclusive cultures. SS: Like I said, I take all the help I am offered. I have a huge support system – my live-in help, my mom and my mom-in-law. My husband is the center of my support system, that place I always go to talk things through, whether it’s a feeling of joy or fear. He always has an ear for it and the best advice. SS: It doesn’t matter if it’s a saree or a suit. You walk in with confidence, own the seat that you sit in, and you speak for what you represent. I think it’s just you. AIM: Your advice to women in tech? SS: Moving from middle level to senior level management is a tricky thing. When you are in the mid-level management, you tend to get comfortable — you’ve built your network, you have your mentors. But moving to a senior level management is different. The first piece of advice to all women in tech is to network – make connections horizontally in your organization and outside your organization. They will come in handy as you go up. There will be friends everywhere. Second advice is to know the finances of your organization. SS: It helps if the company is aware that a woman employee is trying to maintain a work-life balance. Flexibility, good relationship with your managers, and camaraderie with teammates — these things are crucial to a woman. I worked for 15 years in an organization, despite getting better job offers, because of the work environment. Even now, at GE Digital, that flexibility and understanding is a crucial part.